The 2018 Hurricane Season began on June 1 and continues through November 30. To encourage storm preparedness, the Census Bureau compiled American Community Survey data showing that 54.3 percent of residents had an emergency water supply; 82 percent had enough nonperishable food to sustain the household’s occupants for 3 days; 51.5 percent of American homes have an emergency evacuation kit; and 18.3 percent of single-family homes (excluding manufactured/mobile homes) have a generator to supply power in case of an outage. Photo courtesy of the Rhode Island Department of State. The 1938 New England Hurricane was the first major hurricane to strike the region since a category 3 storm in 1869. When the storm was over, it had damaged or destroyed approximately 57,000 homes (like this one in Charlestown, RI), killed as many as 800 people, and toppled more than 2 billion trees. Total value of property lost was an estimated (inflation-adjusted) $5 billion. New Englanders had little warning of the fast-moving category 3 hurricanes that slammed into the region on September 21, 1938. Nicknamed the “Yankee Clipper,” “Long Island Express,” and “Great New England Hurricane,” the storm carved a path of destruction across Long Island, NY, and New England. Eighty years later, the storm is still the strongest and most deadly hurricane to ever hit New England. In early September, the 1938 storm formed off the west coast of Africa and briefly strengthened to a category 5 hurricane by mid-month. On the morning of September 21, the weakened category 4 hurricane was off the coast of Wilmington, NC. In just 6 hours, the storm raced up the eastern coast of the United States to make landfall at Bellport, NY, with sustained winds of 120 miles per hour (mph). Barreling northward, the storm pushed a wall of seawater ahead of it that created tidal surges of 15 to 20 feet along the Long Island and Rhode Island coasts. Rhode Island’s Narragansett Bay communities were hardest hit. Near the bay’s mouth, the storm swept away the Whale Rock lighthouse, killing light keeper Walter Eberle. Several miles away, waves swept away the lighthouse keeper’s home on Prudence Island, killing light keeper William Gustavson’s wife and son. Surging water swept away people, cars, and homes so quickly that most victims had little time to react to the rapidly deteriorating conditions as popular tourist destinations like Block Island, Charlestown, and Westerly were almost completely submerged. By suppertime, waves were battering the Massachusetts coastal towns of New Bedford and Fall River near Rhode Island and Ipswich and Newburyport at its northern border with New Hampshire. Category 2 winds decimated forests near Petersham, felling 70 percent of the region’s trees. As the storm charged up Massachusetts’ Connecticut River Valley, heavy rains(combined with runoff from other recent storms) flooded towns along the river and its tributaries including Springfield, Chicopee, and Greenfield. Weakening to a category 1 storm when it crossed Massachusetts’ northern border, it became the first and only hurricane to ever strike Vermont. Extensive flooding washed out roads and bridges in Brattleboro and Middlebury and derailed a train in Castleton. Wind uprooted groves of the state’s prized sugar maple and apple trees and a falling elm injured two theater patrons in Montpelier. Along the storm’s periphery, wind and flood waters damaged bridges and trees in New Hampshire. A fire burned uncontrolled for hours in downtown Peterborough after flooding prevented firefighters from battling the blaze. The observatory at Mount Washington—the region’s highest peak—recorded wind gusts exceeding 160 mph. Further east, counties in Maine (particularly York and Androscoggin) experienced extensive power outages and wind damage to trees and buildings. The storm blew through Burlington, VT, and crossed into Canada by 10:00 p.m. Soon after, it became an extratropical cyclone and dissipated over northern Ontario. In its wake, the 1938 New England Hurricane left approximately 800 dead, damaged or destroyed thousands of buildings, toppled more than two billion trees, cut power to millions, and left residents of some of the region’s largest cities swimming in 10 feet or more of debris-filled flood waters. When adjusted for inflation, the hurricane caused an estimated $5 billion in damage. 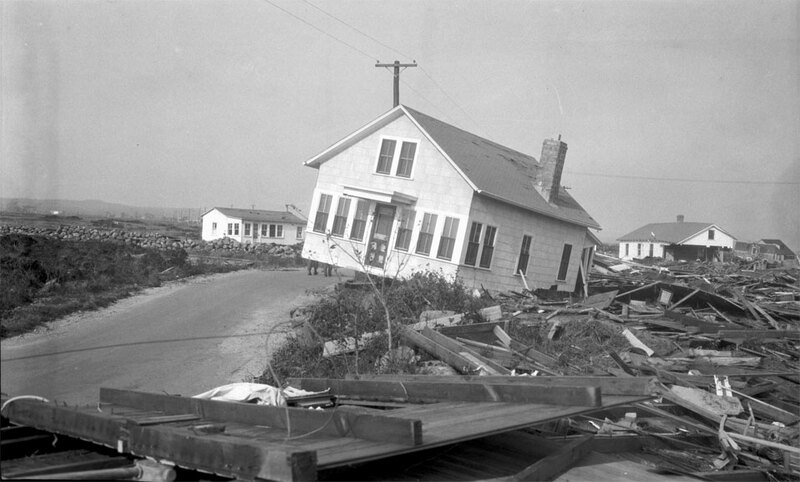 The 1938 New England Hurricane was the first major hurricane to strike New England since 1869, and the most destructive to ever reach the region. The storm impacted more than 8 million people in the six New England states. At the time of the 1930 Census, the population of New England was 8,166,341 (Connecticut, 1,606,903; Maine, 797,423; Massachusetts, 4,249,614; New Hampshire, 465,293; Rhode Island, 687,497; and Vermont, 359,611). Two years after the storm, the states’ population grew to 8,437,290 (Connecticut, 1,709,242; Maine, 847,226; Massachusetts, 4,316,721; New Hampshire, 491,524; Rhode Island, 713,346; and Vermont, 359,231). Today, New England is home to 14,810,001 (Connecticut, 3,588,184; Maine, 1,335,907 ; Massachusetts, 6,859,819; New Hampshire, 1,342,795; Rhode Island, 1,059,639; and Vermont, 623,657). As the 1938 hurricane swept across Massachusetts on the evening of September 21, the Blue Hill Observatory in Milton, MA, recorded the storm’s maximum sustained wind at 121 mph and one of the highest wind gusts in history—an astonishing 186 mph! The storm produced a 20-foot storm surge in Rhode Island’s Narragansett Bay and 50-foot waves off the coast of Gloucester, MA. Areas of Providence, RI, and New Bedford, MA, were under as much as 14 feet of water, and residents of the western Massachusetts town of Ware required air-dropped food and medicine until flooding subsided. The hurricane’s forward motion was the fastest ever recorded—achieving speeds of 60–70 mph. In the early morning hours of September 21, the storm was several hundred miles southeast of Cape Hatteras, NC. It was near Virginia Beach, VA, by 9:00 a.m.; Cape May, NJ, by noon; and plowed into Bellport, NY, as a category 3 storm with 120 mph winds by early afternoon. The storm’s 115 mph winds buffeted New Haven, CT, at 4:00 p.m. and Westfield, MA, by suppertime. Hurricane-force winds continued as the storm passed Montpelier, VT. By 10:00 p.m., New England could breath a sigh of relief as the weakened storm passed into Canada. 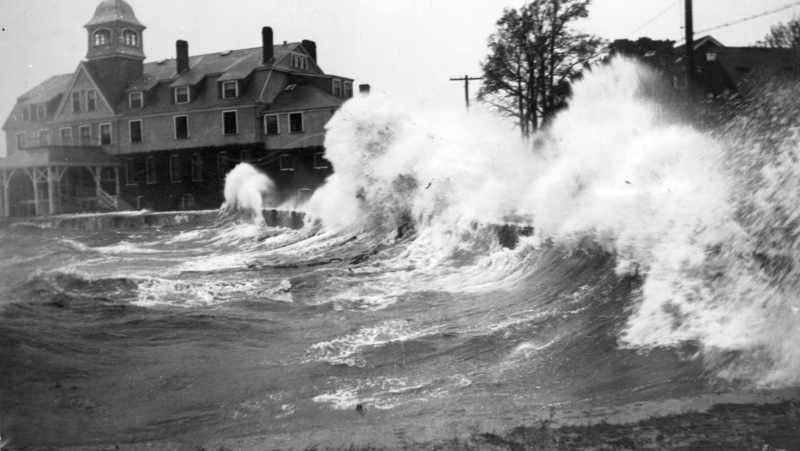 The 1938 New England Hurricane hit Rhode Island’s Narragansett Bay region particularly hard. The storm surge that inundated the coast swept homes, automobiles, and families into the ocean. Some of the state’s 262 victims included Jamestown school children Marion Chellis, Constantine and John Jranitis, and Joseph, Eunice, Teresa, and Dorothy Mateos who drowned when flood waters engulfed their school bus; Tiverton drowning victims Etta Schlegel and Jessie Hathaway; Providence millworker Clorinda Lupoli killed by a collapsing wall; Ann, Florence, and Harriet Clark of Shannock, RI; Providence builder Robert Collinge; and Philadelphia, PA, socialite Maria Norris and her son John, who drowned when the storm swept their Narragansett summer home into the ocean. In 2016, coastline counties adjacent to the Atlantic Ocean, Gulf of Mexico, and the Pacific Ocean were home to 94 million people—29 percent of the U.S. population. Of this population, hurricanes threaten 59.6 million people in Atlantic and Gulf of Mexico coastline counties. Despite the threat of violent storms, the populations of these counties continue to grow. Since Hurricane Katrina in 2005, the population of the nation’s Atlantic Ocean and Gulf of Mexico coastline counties rose from 54.5 to 59.6 million. In particular, Harris County, TX, (which includes the nation’s fourth largest city of Houston) saw its population grow by 1.2 million (a 35 percent increase) since 2000—the largest numeric gain of any county in the United States.You can use census data to learn about many of the nation’s historic hurricanes. Visit the U.S. Census Bureau History Office’s archives to learn more about the 1900 Galveston Hurricane. Also, visit the Census Bureau’s Emergency Preparedness Web pages to find data about more recent storms including 2005’s Hurricane Katrina and the back-to-back storms (Hurricanes Irma and Maria) that devastated Puerto Rico in 2017. Photo courtesy of the National Science Foundation. coast of Gloucester, MA. Areas of Providence, RI, and New Bedford, MA, were under as much as 14 feet of water, and residents of the western Massachusetts town of Ware required air-dropped food and medicine until flood waters subsided.